“The Sapara do not believe in cemeteries,” said Rosa Dahua, an Indigenous leader from the Ecuadorean Amazon. She was seated on a wooden stool with an anaconda carved into its base, and she leaned forward as she spoke, her dark hair falling in waves over her shoulders. worry more drilling would spell disaster for their communities. Dahua is the vice president of the Association of Sapara Women of Ecuador, an organization dedicated to maintaining the cultural identity of the Sapara and promoting equality for Indigenous women. She was eager to describe some of the ancestral customs that are still practiced by the Sapara today. The Sapara are one of seven Indigenous nations that will be affected by a new oil boom in the central south region of the Ecuadorean Amazon. On Nov 28, Ecuador is set to open its 11th licensing round for oil exploration — a chance for private oil companies to bid for 13 blocks in the Amazonian provinces of Pastaza and Morona Santiago. Petroamazonas, Ecuador’s state run oil company, has also announced plans to collaborate with foreign companies to develop three additional oil blocks in the region. Ecuador’s Minister of Nonrenewable Natural Resources, Wilson Pastor, has said that companies will have until May 30 to place offers and that all contracts should be cemented by September 2013. 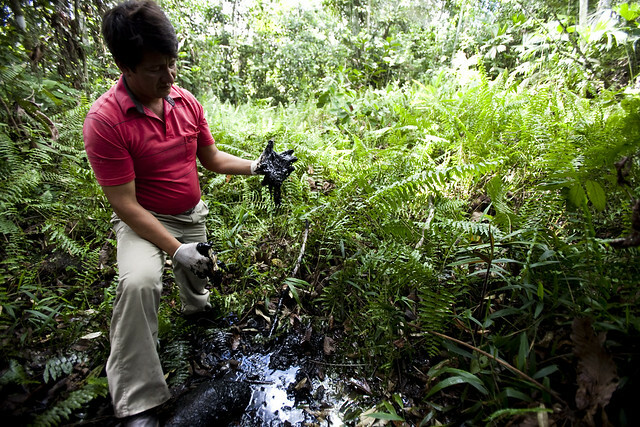 Ecuador is expecting some $1.2 billion in investments from the oil blocks. According to Amazon Watch, the 11th round will affect up to 10 million acres of primary forest that encompass the ancestral territories of the Indigenous Andoa, Achuar, Kichwa, Sapara, Shiwiar, Shuar, and Waorani nations. Ecuador’s largest Indigenous organizations, including the Confederation of Indigenous Nationalities of the Ecuadorean Amazon, CONFENIAE, have made public statements denouncing the 11th round. The CONFENIAE alleges that the undersecretary of hydrocarbons entered Achuar, Kichwa, and Sapara communities without permission in October in order to hold consultations with the local people. The CONFENIAE says that these consultations were illegitimate because they engaged a select group of individuals, rather than the traditional government structures of these nations. “[The Ministry of Hydrocarbons] used members of Indigenous communities who are uninformed [of decisions being made by community leaders] because they are actually living outside of their communities,” said Patricia Gualinga, a Sarayaku leader and member of the CONFENIAE. The leaders of the affected Indigenous nations say that the hydrocarbons ministry’s consultation process violates the judgment that was made this July by the Inter-American Court of Human Rights in the Sarayaku vs. Ecuador case. The ruling specified that consultations should be conducted in good faith following appropriate cultural procedures and must aim to reach an agreement. Sarayaku territories aren’t part of the areas to be opened up for exploration in the 11th round, but land adjacent to theirs are, and the Sarayaku fear that if there are oil explorations nearby, their land and water sources will be also be contaminated. The Sapara, whose territory straddles the border of Ecuador and Peru, have much at stake since their land is within one of the exploratory blocks. “The majority of Sapara communities are against oil exploration,” said Marco Montaguano, vice president of the Sapara Nation. The Sapara were once among Ecuador’s most populous Indigenous peoples, but the arrival of the Spanish colonists and subsequent onslaught of smallpox led to a steep decline in their numbers. There are less than 50 people alive today who can claim full Sapara ancestry, according to the Association of Sapara Women. Additionally, only 10 elders speak Saparoano, the mother language of the Sapara. For this reason, UNESCO declared the Sapara nationality an “Intangible Cultural Heritage of Humanity” in 2001. Gloria Ushigua, president of the Association of Sapara Women, worries that the oil companies will completely annihilate the Sapara Nation. Humberto Cholango, president of the Confederation of Indigenous Nationalities of Ecuador or CONAIE (of which CONFENIAE is a member), said that Indigenous groups plan to hold demonstrations in the upcoming months. The CONAIE also intends to take action in Ecuador’s Constitutional Court. Meanwhile, Indigenous youth are using communications technologies, such as video sharing on YouTube, to start conversations both in their communities and internationally. Nina Siren Gualinga, a 19 year old from Sarayaku has been working with her uncle, Eriberto Gualinga — this year’s winner for Best Documentary at the 2012 National Geographic All Roads Film Festival — to develop short films that convey how the 11th round threatens indigenous culture (see video below).